I’ve long been a fan of Holiday’s writing. In Trust Me I’m Lying and The Obstacle is the Way, Holiday presented refreshing views on marketing and Stoicism. 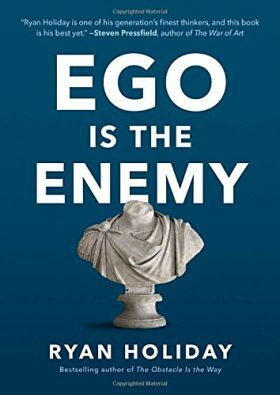 In his latest book, Ego is the Enemy, Holiday asks the next question when embracing the obstacles in your life, namely how to achieve your goals with your ego in check. It is precisely these people that are understated in most business and history books and, simultaneously, precisely the ones from which we can learn the most. Stories about the Stoics and more contemporary figures like General Sherman and Bill Bradley all shed light on the differences between those who seek recognition and stroking of their ego, versus those who put their noses down and chase after a higher purpose. Holiday’s writing style is brilliant in another well-researched book. His mindset and arguments are some of the best I’ve experienced, especially when dissecting difficult topics like this. This book is a quick read that will yield tons of notes for the serious student. Dig a little deeper by looking up some of the referenced works and you’ll know more than 99% of the population on some very important topics like success, failure and human nature. This book is a must-read for my private clients.